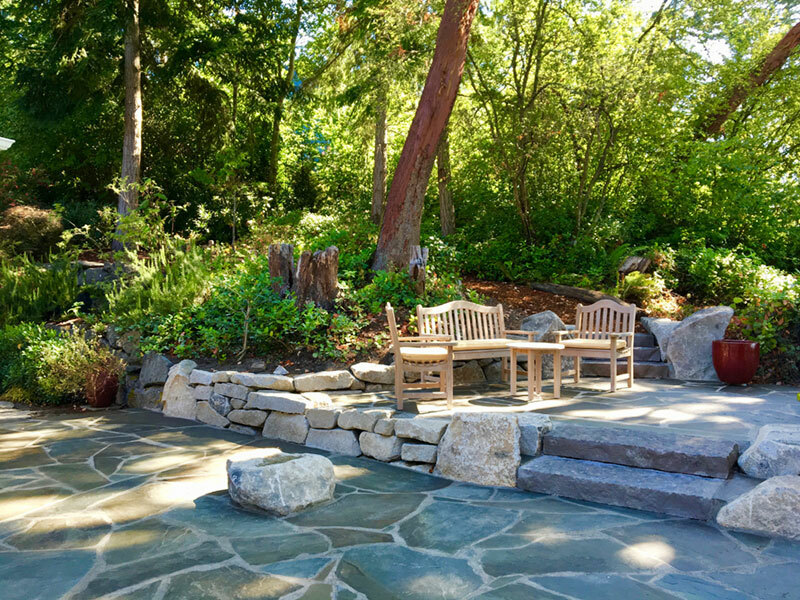 The smaller connecting raised patio is carved out of the hillside and pulled back from the edge of the high bank, providing a more intimate space for conversations and reflection. 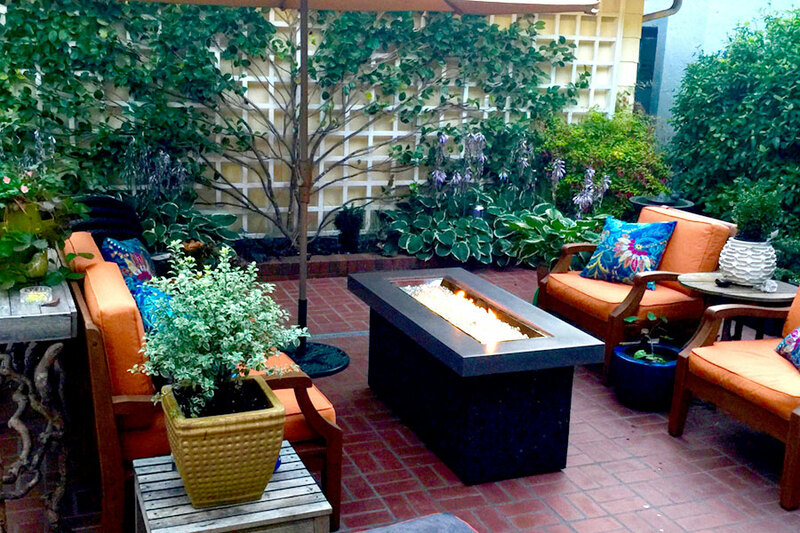 Deborah Cheadle, owner of Deborah Cheadle Design and member of APLDWA since 2010, brings to her garden designs a passion for creative solutions to her clients' needs, tastes and budgets. 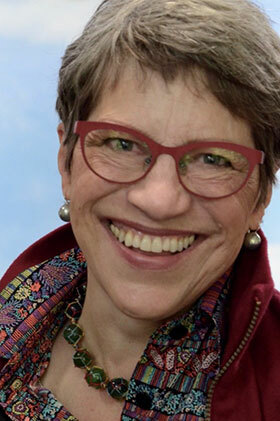 Deborah has honed her knowledge and understanding of plants over 40 years of working in her own 1.5-acre garden, which has been included in many local, national and international tours. 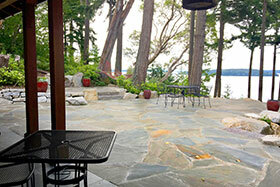 Her personal garden is noted for its design which combines intimate spaces, grand views and year-round plant interest. 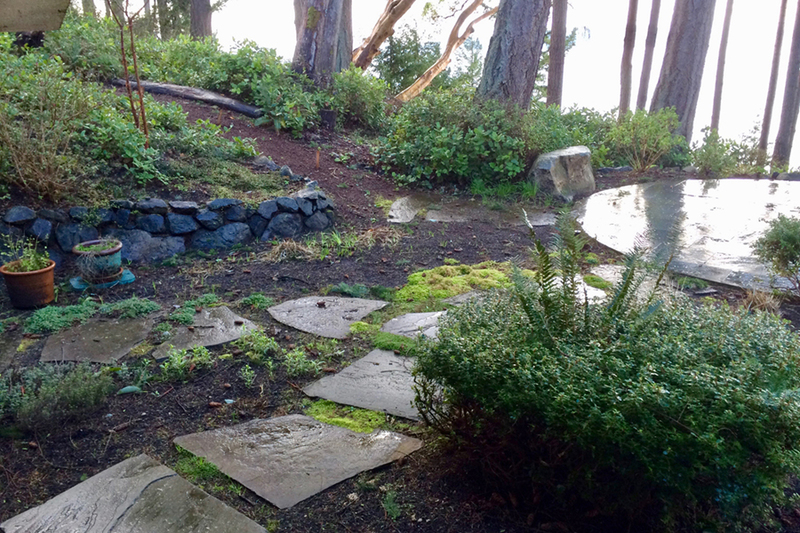 Deborah's approach to garden design arises from an innate understanding of the importance of relating a garden to the home it surrounds, an understanding that was honed with her study at Edmonds Community College in Horticulture and Design. "When a house sits well-grounded on the land, with an easy connection from inside to out, it's as if the home itself has been expanded", says Deborah. "Time and again, clients invite me to stand on the thresholds of their homes, and, looking out and opening their arms wide say, 'I want to be drawn out into the garden, both physically and visually'," says Deborah. This is especially important in the Pacific Northwest with our long, dark winters. Thoughtfully-considered window views connect one to the changing seasons and enhance awareness and appreciation of the never-static natural world. Connection to the world outside one's windows is often not solved with the placing of a few plants, however. It may require some rectifying of the discrepancies in grade between a house and its surrounding land. 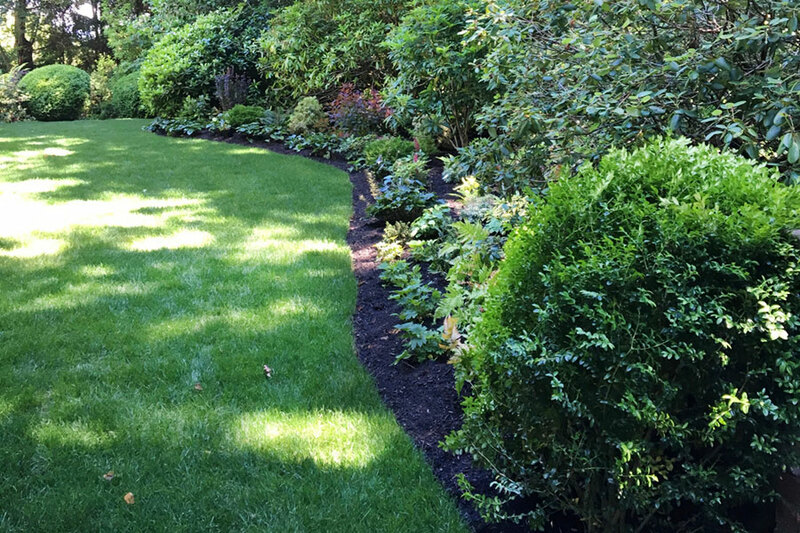 Landscaping that includes grading and hardscape is a significant investment, with a payoff in both the on-going enjoyment of the homeowner as well as in a home's resale value. 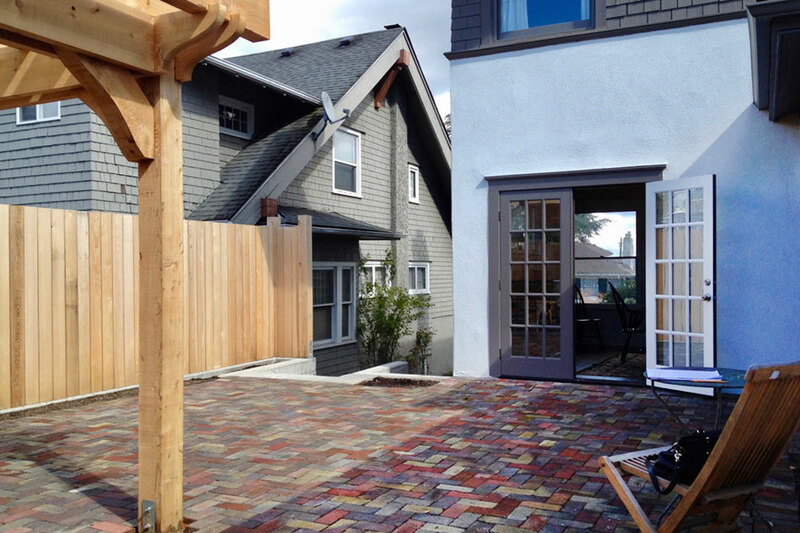 Yet, successful results can be accomplished for less with materials such as gravel, concrete blocks and treated timbers instead of brick, flagstone and poured concrete walls. Deborah listens carefully to the homeowner, collecting information about their desires and goals, values and priorities, and their budget. 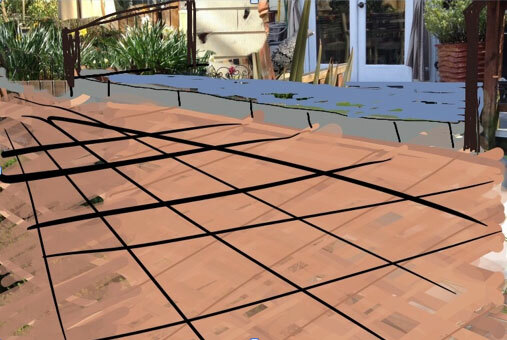 She then immerses herself in the project - in the site, in pedestrian and auto circulations patterns, in the light, the neighboring areas, and the views. 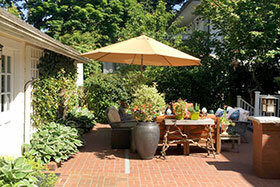 Only then does she begin the process of sketching out ideas to solve the client's intentions for their garden. "Nothing makes me more pleased than a satisfied client!" Early concept sketch made with an IPad drawing app. 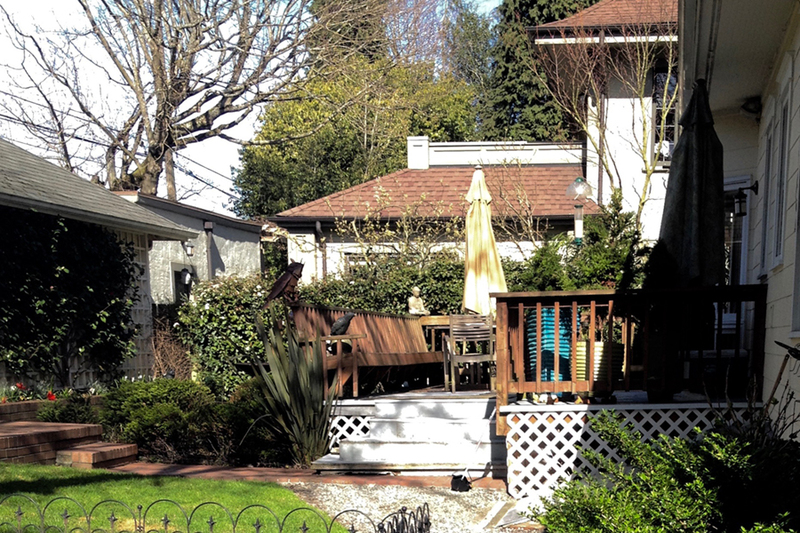 This homeowner on 17th St. in Capitol Hill is an avid gardener, but previous landscape design installations had become layered on top of one another, resulting in a lack of cohesiveness. 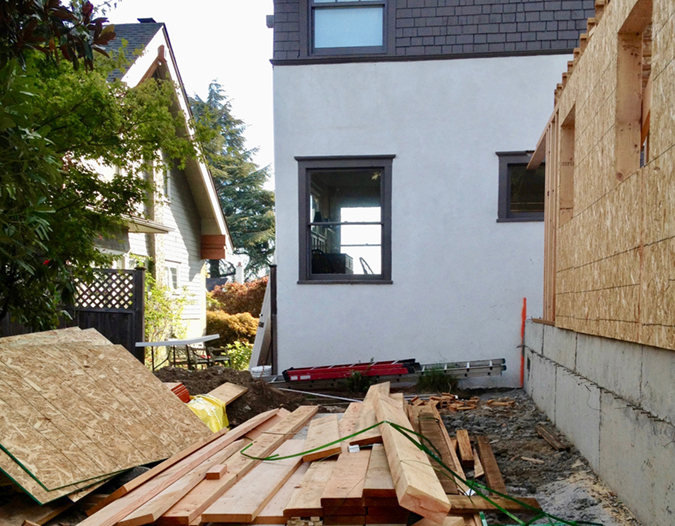 Like so many homes in Seattle, the house sits high above its lot to allow a daylight basement. Access to the garage from the back kitchen door involved a treacherous walk at an angle across a slippery deck, a 45° turn to descend a short, steep set of stairs, then along a narrow brick walkway and up more stairs to the garage entry. Carrying groceries from the car, or racing to work in the winter was a potentially dangerous undertaking! The key to solving this unsatisfactory ingress/egress was to connect the grades between the backdoor of the house and the door into the garage. Raising the grade to connect the two doorways also simplified the many different levels of the surrounding areas of the garden. 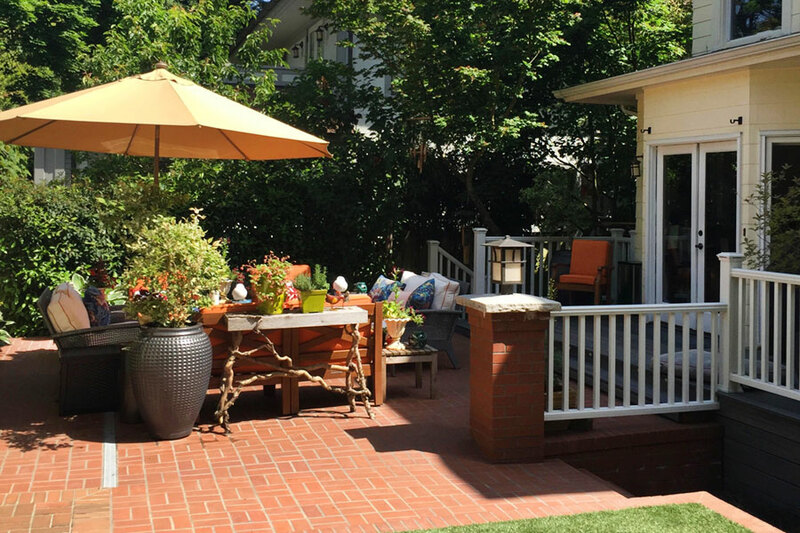 Understandably, the client was not expecting such a radical change when she asked me to replace her deck with a porch and re-think the garden. "But," says Deborah, "the more I looked at the existing issues and the multiple areas at different, and often not compatible, levels, the clearer it became that we had to deal with the grade." 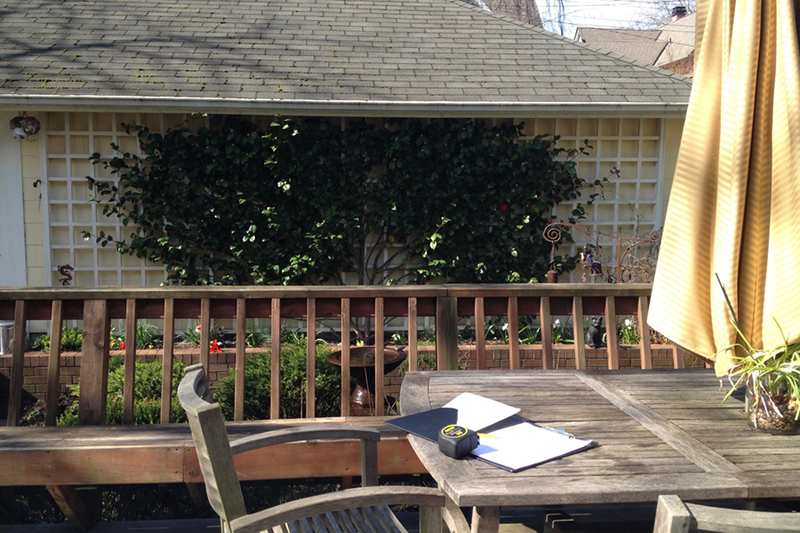 The client had a wonderful espalier camellia along the garage wall, but her view of it from the house was obscured by the existing deck railing. 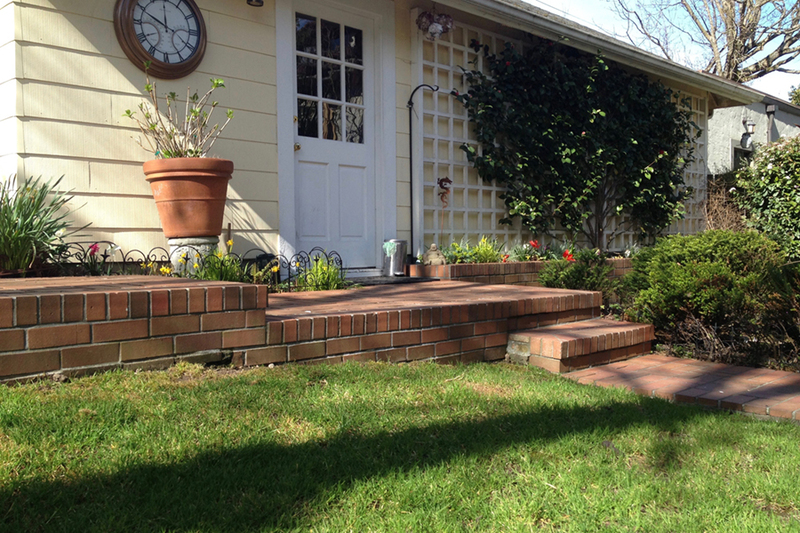 Additionally, standing on the raised brick planter to maintain the espalier was challenging. 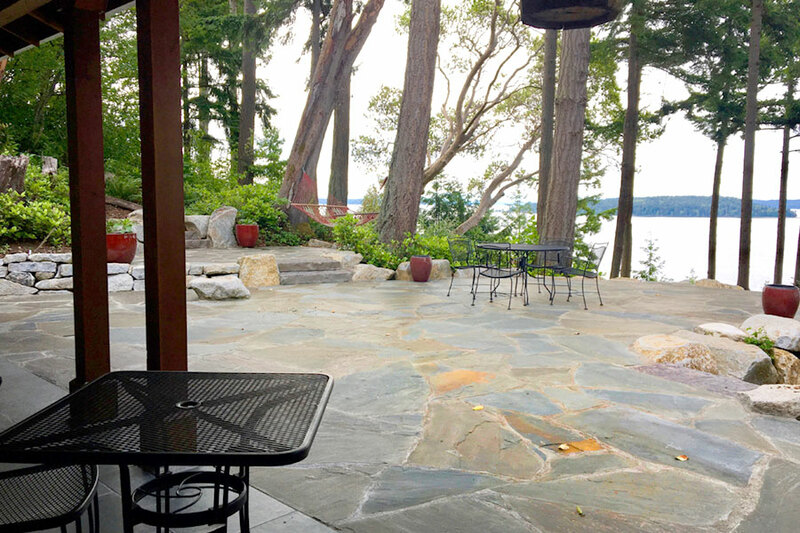 By replacing the deck with an at-grade patio, the camellia now is the focal point of the patio, with easy access for pruning. 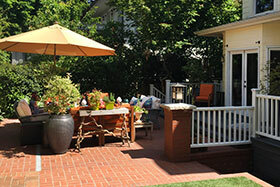 The patio has become a frequently used new room for the house. "I love it," says the client. "It's changed my life. I've been entertaining regularly, even in the winter [under a market stall tent], because it's so easy and nice to move out to the patio from the house." 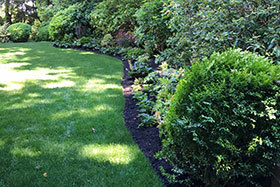 Front border low-growing plants provide year-round interest by combining evergreen and deciduous plants. Seasonal color changes and varying leaf textures engage the eye. 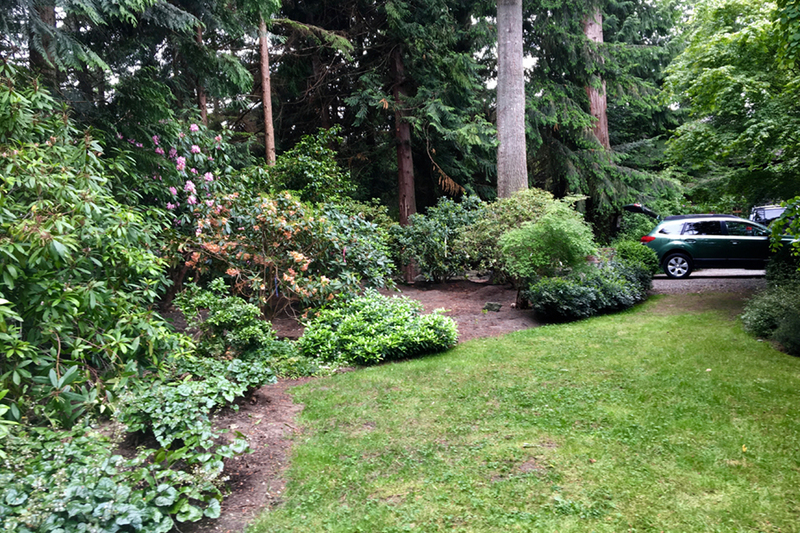 One year after installation: After months of successive Spring Rhododendron blooms, the new planting is filling in nicely, with blue Hosta, orange autumn fern, and red Berberis providing color amongst the varying greens. 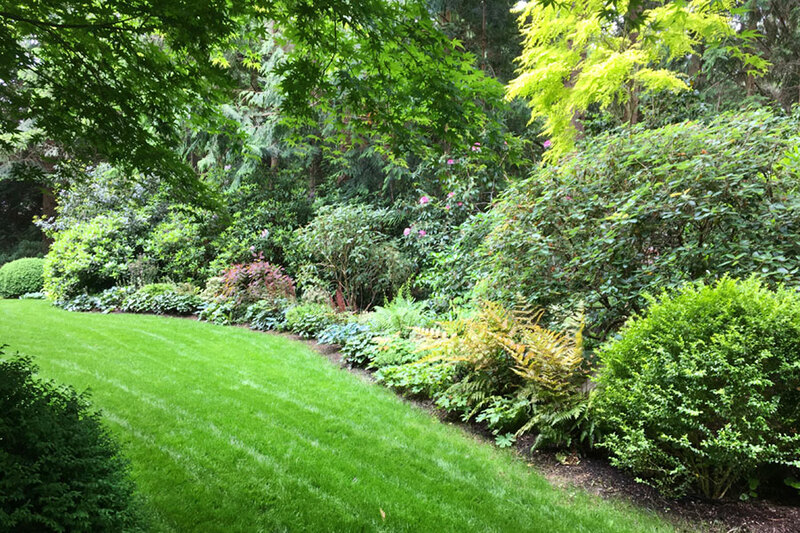 This client, new to the Northwest and her home, which had once been beautifully landscaped but was now overgrown and dark, had read, observed and become a very knowledgeable PNW gardener in a very short time. But when it came to making a plan to refurbish part of her new garden and create some screening, she knew she wanted help. 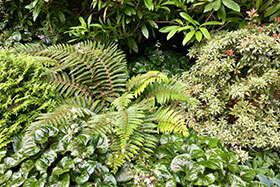 She had visited Deborah's garden during a tour and liked her combinations of colors, textures and plant varieties. By wanting more light, the client faced a not-uncommon situation in our fast-growing northwest gardens. In this case, a row of fir trees had grown spindly and messy and blocked light. However, once the trees were removed, an unwanted view of the neighbor's house needed to be re-screened. 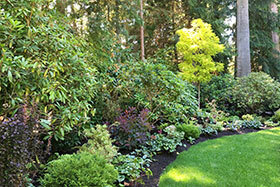 The client didn't want a fence, she wanted to use plants which could handle the existing low-light level. Almost all of the existing plants in the bed had become tall, lanky and shapeless from a lack of light. "Gardens are not static," Deborah explains. "They are constantly growing and changing. 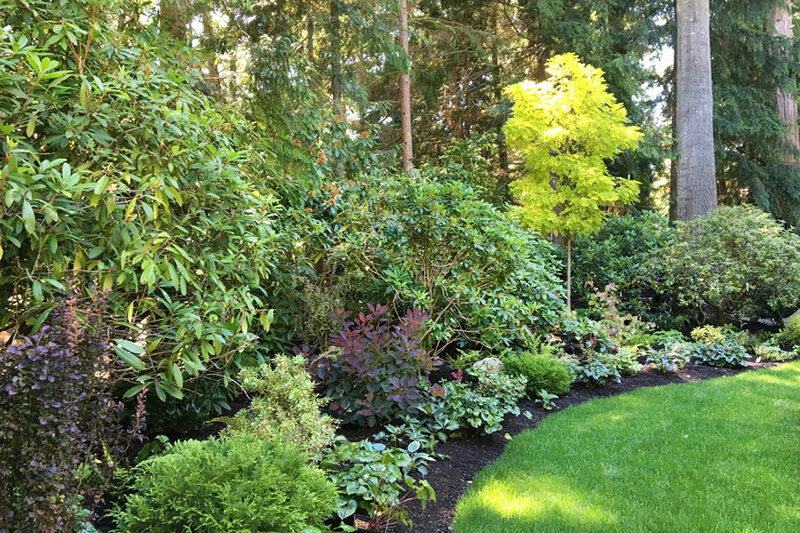 Particularly in the Pacific Northwest, with our great growing conditions and long growing season, mature plants sometimes simply outgrow their allotted space. 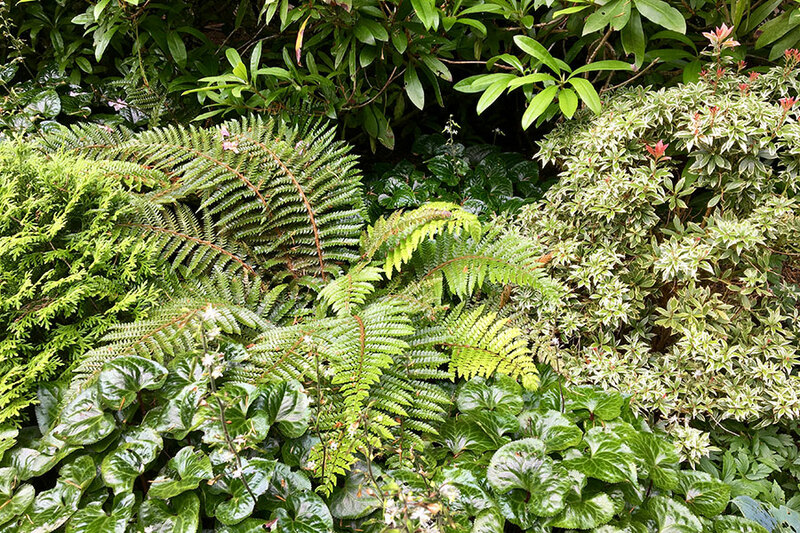 It's hard to acknowledge the need to remove mature plants that have done a yeoman's job for so many years, but removing them usually opens up wonderful opportunities for a refreshed garden." Deborah's participation in this job involved three parts. 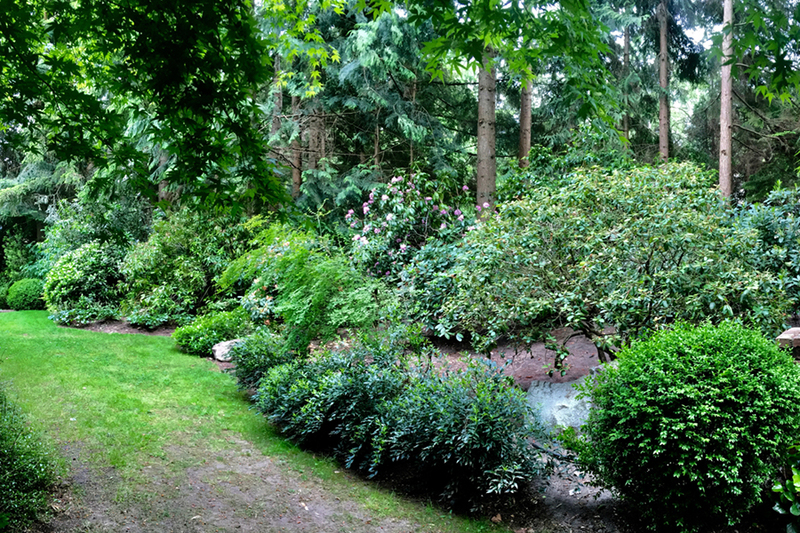 First, she acted as a sounding board as the client selected existing trees to remove and chose where to plant a semi-load full of full-sized, blooming Rhododendrons she'd field-picked and purchased. 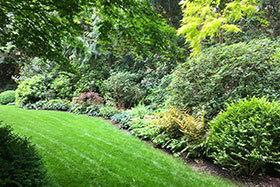 Secondly, Deborah prepared a new planting design for the area around the Rhododendrons, selecting plants that could handle the light conditions and would more easily keep to an appropriate size. In this phase, Deborah helped the client find and purchase plants and she oversaw the installation. And finally, as an included part of her close involvement with her clients, Deborah passed on maintenance information about the proper care and pruning of the garden plants, ensuring their health and shape into the future. 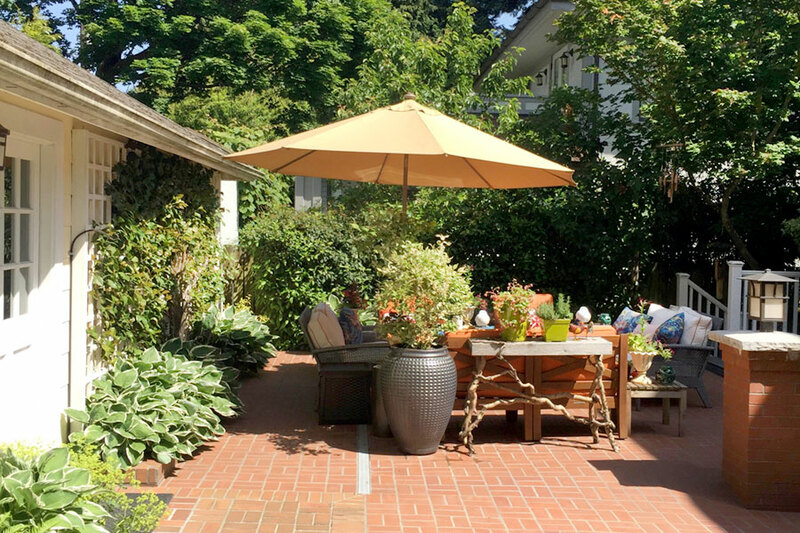 Deborah received this lovely note from her client at the conclusion of the installation: "The garden turned out so beautifully, and it was fun along the way! I so enjoyed our time together – a treat and a pleasure every time."